how to install high low converter? 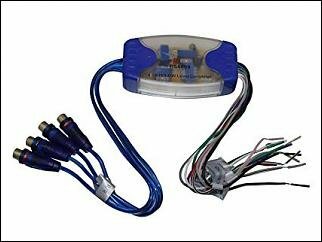 Hello everyone, I have a 2007 Civic 4-door - head unit. components infinity, Amp zed- 4 channels and JBL sub. Can someone please tell me how to connect it? All cables stretched. I understand that this thing needs to be connected to the wires from the car speakers, the wires that go to the head. Rear speakers will not be connected to the amp, only front. FL- FL +, FR- FR +, RL- RL +,RR- RR+, GROUND, REMOTE OUT, 12v. on other side there is 4 rca cables. 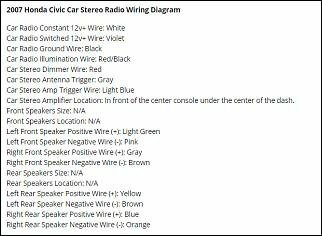 Ground from the high low converter to black wire on the head unit, 12v from the converter to a violet wire on the head unit, and the remote out to an amp? and the FL- FL +, FR- FR +, RL- RL +,RR- RR+ that comes from the converter need to be connected to the speakers wires that comes from the head unit?